Remember the woman fired for flipping off the Trump motorcade? Now, she’s suing. became a national celebrity/spectacle (depending on your point of view)? 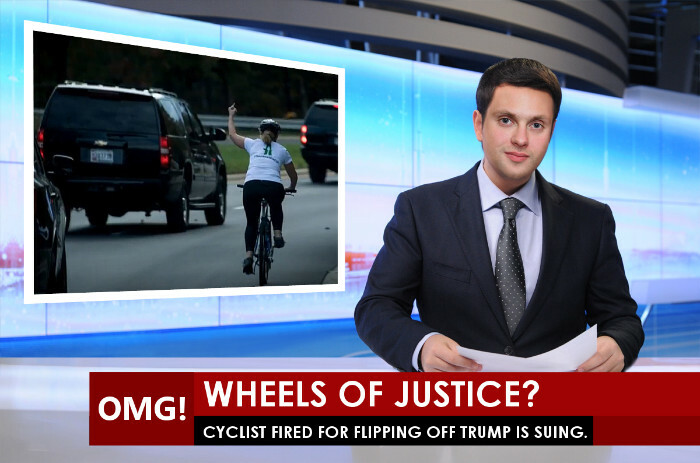 As I say a silent prayer to the blogging gods, read on as I discuss the lawsuit the cyclist just filed against her former employer and offer some practical advice for employers. May I see the filed complaint, Eric? But Eric, it’s 21 pages. Can you summarize it for me? Wrongful Discharge. She claims that both the Virginia and U.S. Constitutions protect her right to engage in political speech, which trumps (pun kind’ve intended) her employer’s ability to fire her for said political speech. Breach of contract. She claims that her former employer promised her four weeks of severance, but only provided two. Wait, she got severance, and she’s suing? Can’t put anything past you, can I? The plaintiff claims that she was forced to resign. But, she seems to want to have her cake and eat it too. I would expect to hit this HARD. Why didn’t she include a gender-discrimination claim? The complaint references how the company did not fire a male employee that allegedly engaged in inflammatory political speech on Facebook. Then again, he wasn’t featured on late-night television, and his post didn’t go viral. But, it’s possible that claim is forthcoming while the plaintiff exhausts her remedies first at the EEOC. Why did she really sue? While acknowledging that the First Amendment protected my right to extend my middle finger, my boss told me that “corporate protection” dictated that he terminate me on the grounds of a social media policy that prohibits “obscene” or “inappropriate” content. Akima does business with the government, and company executives obviously feared that the Trump administration would (unconstitutionally) penalize my employer for my gesture. So, that Tuesday, they forced me out. The First Amendment bars retaliation against me by Trump. But Trump doesn’t need to punish me for my speech if fear of him spurs my employer to do it. And a private employer can’t suppress my freedom of expression on my own time out of fear of illegal government retaliation without violating Virginia employment law, which is why I filed a lawsuit against my former employer this week. And here she is talking about on the Post’s YouTube channel. Eric, aren’t you always trumpeting how employees have no freedom of speech online? Yes, I am. Here’s last week’s post. Unless the Commonwealth of Virginia has explicit protections for employee political speech — I don’t think it does — I don’t see this ending in victory for the plaintiff. Use this example as yet another way to educate your employees about how social networking — even off the clock — can impact one’s employment. Sometimes, employee online speech is protected. Some states do safeguard employees that engage in political discourse, online or offline. Also, the National Labor Relations Act gives covered employees the right to act together to try to improve their pay and working conditions, with or without a union. Enforce your rules evenly. While I’m not suggesting that the cyclist and her male co-worker are appropriate comparators, you may encounter a situation in your workplace where two employees in two separate protected class engage in the same misconduct. If the same discipline does not follow for each employee, you may open yourself up to a discrimination claim.